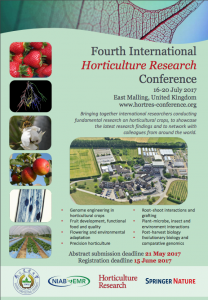 The world’s leading plant scientists are set to gather for the Fourth International Horticulture Research Conference, taking place at NIAB EMR in East Malling, Kent, from 16th to 20th July 2017. The Conference will bring together international researchers conducting fundamental research on horticultural crops, to showcase the latest research findings and to network with colleagues from around the world. Abstract submission is now extended until 21st May 2017. The previous International Horticulture Research Conference was held in the Nanjing Province, China, in October 2016 and was attended by over 200 delegates from 10 countries.